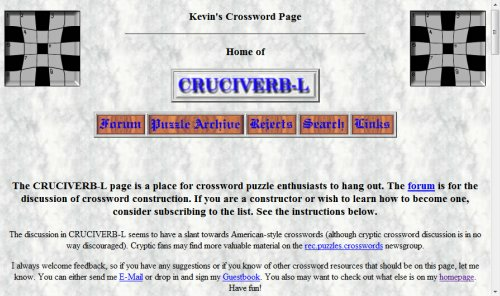 In the world of crossword puzzle making, American style, Cruciverb.com is probably the most important site you need to know about. As a matter of fact, you'll be hard pressed to find a professional crossword constructor in America who does not spend time there. 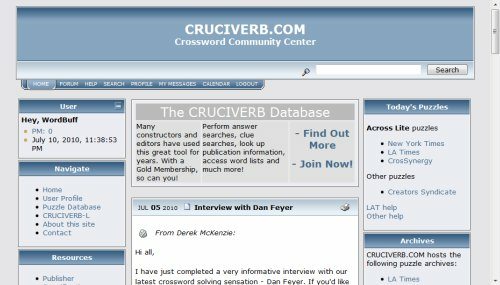 Cruciverb.com has become a Mecca for cruciverbalists (crossword lovers - in case you're new around town!). It's not easy to find out anything substantial about you on the Web. In one interview you say that on the personal front there's 'Not much I really want people to know', but can you tell us just ONE thing about yourself that other cruciverbs probably don't know? Hmm, not sure what interview that was but I think I've opened up a bit over the years. And through my Facebook account I've been able to share info with others. 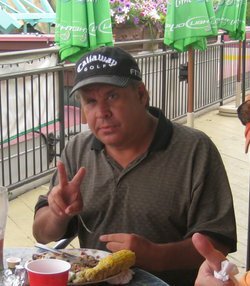 I think a lot of cruciverb folks know I'm a big music fan (especially old acoustic blues), and that I play a lot of pool and golf. What to add to that? I dunno, maybe the fact that I'm a big animal lover. 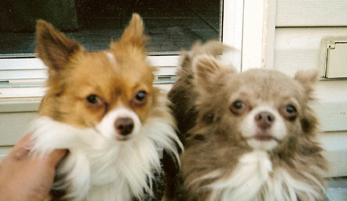 My two chihuahuas, Archie and Mindy, are like my son and daughter. I love them to pieces and spoil them rotten! Well, Kevin, I'm a dog person myself, so that answer does it for me. But have you got anything for readers who don't go all gooey over cute dog snaps? 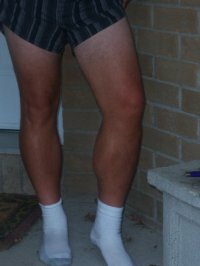 Well, I won the vote for "nicest legs" in the Men's Division at my work, 4 years running. That was in my 20's and I still, at the age of 46, have a damn nice set of legs. My wife gives them an 11-out-of-10. Wanna pic? Oh yes... Now, you obviously have a very hectic schedule. What do you do for a living, and where does most of your time go in a typical day? When you're not taking pictures of your legs, I mean. Life has been very hectic, and for a number of reasons. First, I have a demanding full time job — I work in IT, and have been for 25 years. I've also had health issues. And a couple of years ago I started up a pool league service — a system that allows pool league operators to keep track of stats, develop player profiles, etc. I'm hosting 37 of these sites and it's a lot of work. Unfortunately, all this has reduced my Cruciverb time. I really need to get my focus back on the site because it does mean a lot to me. We go way back! Aah, nice segue thanks Kevin! So, can you tell us when and why Cruciverb was born? At first, my site was just a collection of puzzles I had clumsily put together. I put them up on the web and they were soon discovered by Frank Longo. Frank critiqued them, letting me know where I still had work to do. I figured that this kind of interaction would be even better on a larger scale. I figured there must be other people out there who want to learn how to make quality crossword puzzles, and other people like Frank who would be willing to share their knowledge. And the rest is history. The website has been a good resource, but the real community builder was the CRUCIVERB-L email discussion list. That really brought people together. That's for sure. Can you tell us a bit about the members of CRUCIVERB-L? At last count there were about 900 members. As for constructors on the list, I really don't want to name names. Suffice it to say that just about every "big name" in the biz is either on the list or has been. Most still are. Many of them have gone into lurk and/or digest mode because just about everything has been discussed already. The people who are most active on the list these days are either newbies asking questions or experienced constructors who are not yet tired of answering the questions. And some folks in between. With so many excellent contructors and editors who have contributed on the list over the last 15 years, I just don't think it would be fair of me to mention some and not others. But I'm also pretty taken with Cruciverb's crossword database. There seem to be a few crossword databases out there, but what distinguishes the Cruciverb offering? Well, I'm a bit choosier about what goes in there, so it's smaller than some others. But the biggest thing is that when a puzzle is added to the database I identify theme entries, theme types and also flag unusable words, such as letter drops, that only make sense for the given crossword puzzle's theme. The word lists that derive from the database are therefore rather clean compared to others. Is a database like yours pretty much mandatory for crossword puzzle making nowadays? Do they get abused, as many puzzle publishers feared in the early days? Some of the best crossword constructors don't use a database at all. Liz Gorski comes to mind. But most do. And yes, it has caused a few problems. Will Shortz, editor of the New York Times crossword, sent a message a while back, telling the constructing community that copying 100% of a puzzle's clues from a database is simply wrong. He wants to see originality and doesn't want to have to do all the work to make a puzzle fresh. A puzzle database should be used as a tool, not a crutch. Can you tell us about your first published crossword? 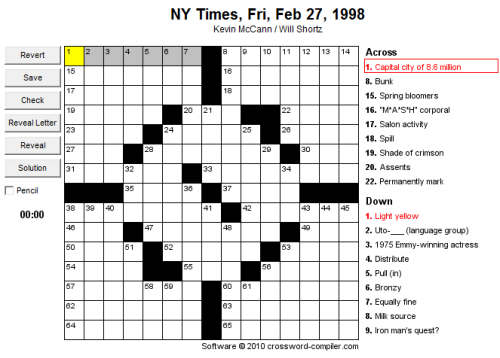 My first published crossword puzzle appeared in the New York Times on Feb. 27, 1998. It was an open themeless Friday puzzle. I was quite proud of that one. Do you make crossword puzzles any more? How would the solver recognize a 'Kevin McCann' puzzle if the byline was absent? I really haven't made enough crossword puzzles to stand out in any way. If there was no byline, nobody would have a clue. Well, I guess they'd have many clues (groan). What resources, other than your brain, do you need to make a good crossword puzzle? You can't go wrong with Crossword Compiler. It's a marvelous tool. I also use the Cruciverb database — it's not a bad resource either! Which puzzles do you solve regularly? I'm not doing much crossword solving these days, but when I do it's usually the LA Times and New York Times. Are you a fast solver? Do you compete in the American Crossword Puzzle Tournament (ACPT)? No, I'm not fast at all. I like to just kick back and take it easy when solving. I did go to the ACPT one time, but not to compete. I just wanted to meet all the people that I've "known" online for so many years. The year I attended the ACPT, the Wordplay documentary makers were there. And Tyler Hinman won for the first time at the age of 20. It was a good time. Now, as you may have noticed, I'm rather fond of word lists. I was really excited to review your new crossword puzzle dictionary, because it's very different to the usual thesaurus-style tomes out there. How did the idea for this dictionary come about? I had been thinking of making one for a while because I had the database already and I figured it wouldn't be much work (laugh!). Then Peter Gordon, from Sterling Publishing, contacted me and asked if I'd like to make a crossword dictionary. So I didn't have to go hunting for a publisher, which was nice. Five years to complete?! What was the most difficult part of the project, and why was Mark Diehl brought on board? Yep, 5 years. It was just a lot of grunt work. I had my database of clues and answers, but not all of the material could go into the book because the whole idea was to make the dictionary as useful as possible. I didn't want clue and answer pairs that only showed up once. So we were looking for repeats. I brought Mark Diehl on board because after 18 months of work I realized that I would never finish in time. Mark was fantastic to work with and I am certainly in his debt. AND FINALLY... Is there anything exciting on the horizon for Cruciverb.com, or is it pretty much on auto-pilot now? I really haven't had time to add anything. It's been hard enough just adding articles on the homepage on a regular basis. I'm hoping to hire a student to help with the pool league sites and that should eventually free up some time for new Cruciverb features. Thanks very much for your time Kevin! And thank you even more for all the work you've done to support the wonderful crossword community. Also folks, don't forget, if you like reading articles about Crossword Puzzles, Scrabble, Spelling Bees, and other word games and puzzles, feel free to pop your name and email address in the box below.